Comedian and actress Amy Schumer ranked No. 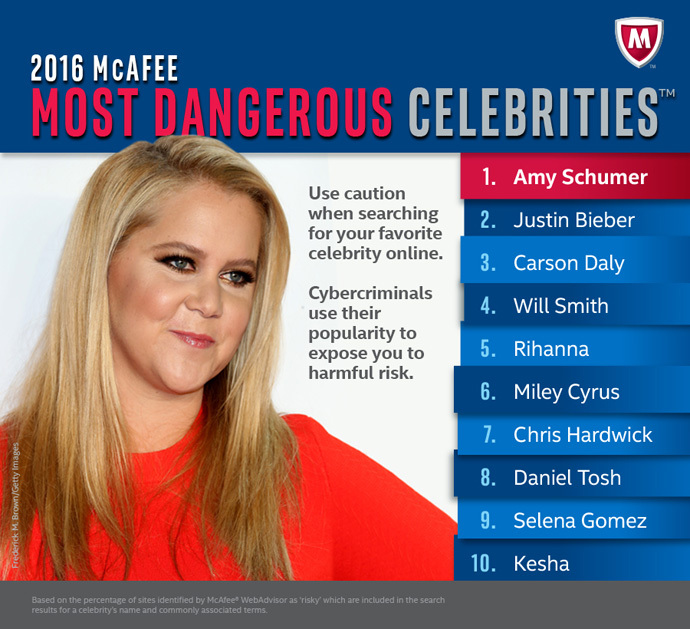 1 on the McAfee Most Dangerous Celebrities™ 2016 study. Now in its 10th year, the study reveals which celebrities, musicians and TV hosts generate the most dangerous search results, potentially exposing consumers to malware. Celebrities in the top 10 include Justin Bieber, Carson Daly, Will Smith, Rihanna, Miley Cyrus, Selena Gomez and more. SANTA CLARA, Calif., Sept. 28, 2016 – Female comedian superstar Amy Schumer knocked electronic dance music (EDM) DJ Armin van Buuren off of the list to become the most dangerous celebrity to search for online, according to Intel Security. 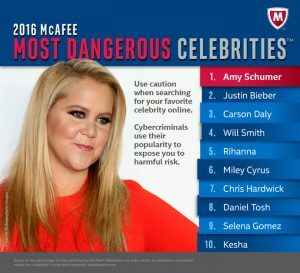 Now in its 10th year, the McAfee Most Dangerous Celebrities™ study, published by Intel Security, researched a broad list of well-known figures including actors, comedians, musicians, TV hosts, athletes and more. This research uncovers which celebrities generate the most dangerous search results that could expose fans to viruses and malware while searching for the latest information on today’s pop culture icons. Amy Schumer is considered to be one of the most popular female comedians who is also known for her work as a writer, actress and producer. Now Schumer can add “first female comedian to take the No.1 spot on the McAfee Most Dangerous Celebrities™ study” to her list of achievements. Justin Bieber came in hot on her heels at No. 2, followed by “Today” and “The Voice” host Carson Daly (No. 3). Schumer is also accompanied by comedian peers in the top 10 with Chris Hardwick (No. 7) and Daniel Tosh (No. 8). Former rapper turned Hollywood A-lister Will Smith is joined by chart-topping musicians such as Rihanna (No. 5), Miley Cyrus (No. 6), Selena Gomez (No. 9) and Kesha (No. 10), rounding out the top 10 list. Savvy cybercriminals continue to leverage consumers’ ongoing fascination with celebrity news – such as award and TV shows as well as movie premieres, album releases, celebrity breakups and more – to entice unsuspecting fans to visit sites loaded with malware that can steal passwords and personal information. The study conducted by Intel Security highlights the various ways hackers can take advantage of consumers’ interest around pop culture news, the risks of their online behavior and how to best protect themselves from potential threats. Amy Schumer topping the list highlights the trend of more people looking to “cut the cord” and move away from cable TV. Consumers are now, more than ever, streaming videos, TV shows and movies online. As file sharing and torrent use continues to grow in popularity, it’s no surprise that TV and movies are a target for cybercriminals seeking to create malicious files. Kicking off her world tour this fall, comedian Amy Schumer tops the list as the Most Dangerous Celebrity – coming in at No. 1. Chris Hardwick (No. 7) of “Funcomfortable” fame and Daniel Tosh (No. 8) were also among the top 10, while Nikki Glaser (No. 15) and Kevin Hart (No. 25) made the top 25. Other funny females to make the list include: Grace Helbig (No. 26), Mindy Kaling (No. 30), Kristen Wiig (No. 52), Chelsea Handler (No. 54) and Ellen DeGeneres (No. 57). This year’s riskiest celebrities included some of the most sensational, chart-topping pop artists such as Justin Bieber (No. 2), Rihanna (No. 5), Miley Cyrus (No. 6), Selena Gomez (No. 9) and Kesha (10). Pop, rap, hip-hop and a bit of country were represented by Drake (No. 13), Katy Perry (No. 14), Jason Aldean (No. 16), Justin Timberlake (No. 17), Jennifer Lopez (No. 18), Lady Gaga (No. 19), Nicki Minaj (No. 20), Iggy Azalea (No. 27), Beyoncé (No. 28) and Usher (No. 29) as they rounded out the top 30. “Today” show anchor and “The Voice” host Carson Daly is the third Most Dangerous Celebrity, while late night hosts Seth Meyers (No. 11) and Conan O’Brien (No. 12) cracked the top 15. Host James Corden, widely known for his popular “Carpool Karaoke,” landed at No. 23, followed by John Oliver at No. 24 and Jimmy Kimmel at No. 32 – previously No. 1 in 2014 and No. 26 in 2015. Bill Maher rounds out the list at No. 34. Three of the four celebrity coaches on “The Voice” this season, along with the host, are all in the top 50. Miley Cyrus leads the pack (No. 6), followed by Adam Levine (No. 41) and Blake Shelton (No. 66), as well as his girlfriend and rotating coach Gwen Stefani (No. 49). Blake Shelton’s fellow country superstars Jason Aldean (No. 16) and Luke Bryan (No. 39) are not far behind. Think before you click! Are you looking for the latest episode of Amy Schumer’s TV show, “Inside Amy Schumer”? Don’t click on that third-party link. Instead, get your content directly from the original source at comedycentral.com to ensure you aren’t clicking on anything that could be malicious. Use caution when searching for “torrent.” This term is by far the riskiest search term. Cybercriminals can use torrents to embed malware within authentic files making it difficult to determine if a file is safe. It’s best to avoid using torrents especially when there are so many legitimate streaming options available. Use cross device protection. Consumers need to protect all facets of their digital lives regardless of where they are, what device they use or where they store their personal data. Use solutions that work across all your devices to deliver protection against threats, such as malware, hacking and phishing attacks. Web surfers can also visit the Intel Security Facebook page at facebook.com/intelsecurity and McAfee Security Advice Center for information on the latest consumer threats and tips for living safe online. If you do decide to search for information on a major event or celebrity in the news, make sure your entire household’s devices have protection, such as McAfee LiveSafe™ service, which helps protect most PCs, Macs and tablets and smartphones. It also includes malware detection software, McAfee® Mobile Security, to better protect your smartphone or tablet from many types of malware. 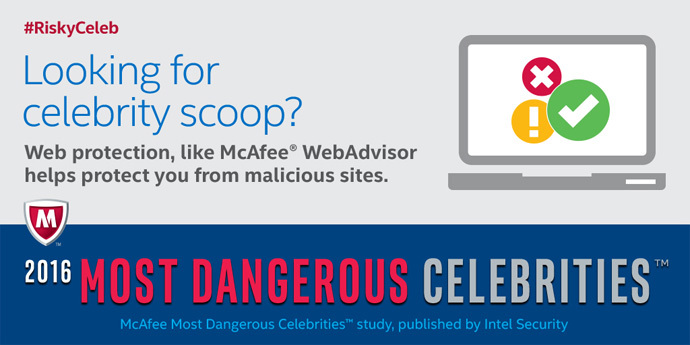 Intel Security conducted the study using McAfee® WebAdvisor site ratings to determine the number of risky sites generated by searches, on Google*, Bing* and Yahoo! *, that included a celebrity name and commonly searched terms (noted below) likely to yield malware. From that, an overall risk percentage was calculated for each celebrity. “Most dangerous” means that these celebrities are likely popular search subjects. The results indicated the percentage of risk of running into online threats – if a user clicked all the results generated by the terms. Fans clicking on sites deemed risky and downloading files including photos and videos from those sites may also be prone to downloading viruses and malware. Intel Security, with its McAfee product line, is dedicated to making the digital world safer and more secure for everyone. Intel Security is a division of Intel Corporation. Learn more at www.intelsecurity.com.